Hancock Corfield and Waller Ltd.
HANCOCK CORFIELD & WALLER LTD was first established in 1891 and we have been supplying point-of-sale material, mainly to the Drinks and Tobacco Industries, since that time. 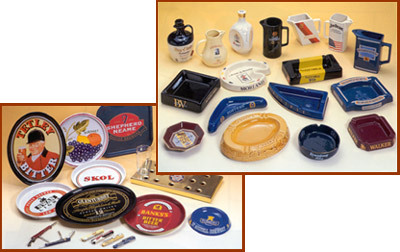 Our potteries are set up solely for the production of incentive/advertising/POS material. We have a large range of standard shapes but individual designs are obviously no problem and above is a selection of jugs, ashtrays and flagons we have produced. Pottery is very versatile and a wide range of items can be made in it. The above picture shows a few items which have been specially modelled and manufactured by us. The most popular items being ceramic bottles and water jugs. We have a range of standard glass ashtray shapes and it is always possible for you to have your own design. Our round and square ice buckets are HC&W designs and exclusive to us. They can be moulded in most colours and are decorated by either hot foil stamping or screen printing. Also in our range are drip trays, bottle pourers and waiter trays. Metal waiter trays are one of our longest running lines and the picture shows you a few examples.